In this composite image, US presidential candidates Donald Trump, left, and Hillary Clinton, right, speak to supporters following strong Super Tuesday performances. "America never stopped being great," Clinton said at a rally in Florida, referencing Trump's campaign slogan. "We have to make America whole," she said, adding that the rhetoric on the Republican side "has never been lower." At his own speech in Florida, Trump shot back. "She wants to make America whole again. I'm trying to figure what that's all about. Making America great again is going to be much better than making America whole again." Trump also spoke of his rival, Rubio, whom he has clashed with fiercely over the past week. "I know it as a very rough night for Marco Rubio. He worked hard, he spent a lot of money. 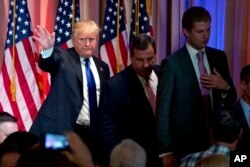 He is a lightweight, like I have said many times," Trump said. "Rubio was the big loser of the night," Trump added. "This campaign, as I think all of you know, is not just about electing a president, it is about transforming America. It is about making our great nation the country we know it has the potential to be." Sanders stressed that Democratic primaries are proportional, and that they award delegates according to the vote count. "By the end of tonight, we are going to win many hundreds of delegates," he said. After the voting finished Sanders released a statement saying his campaign is "just getting started" and that he intends to remain in the race until the party's nominating convention in July. But there was no doubt that Clinton was the "big winner" of the night, according to Mo Elleithee, executive director at the Georgetown Institute of Politics and Public Service. Elleithee, who worked as a Clinton campaign spokesman in 2008, pointed to Sanders' difficulty in attracting voters outside his largely white support base, especially as the primary process moves toward states with larger minority populations. "We've moved past the phase of the campaign where it's about momentum, and it's now about math. And it's pretty clear [Bernie's] not going to have the delegates necessary to win," he told VOA.